Fascinating trivia about artists in turn-of-the-century Paris adds layers of insight to a time of growth and experimentation. The famed Belle Époque was a period of artistic and cultural flowering in Paris that began in 1900 and ended with the First World War. True artistic colossi strode the planet. This is the focus of Mary McAuliffe’s panoramic study, Twilight of the Belle Epoque. The author of Dawn of the Belle Epoque and a lecturer at the Smithsonian Institute, McAuliffe is uniquely positioned to bring this crowded cast of characters to life. She does a thorough job of cataloging the wide range of artistic and scientific achievements while managing to also offer surprising tidbits that add texture to the narrative. 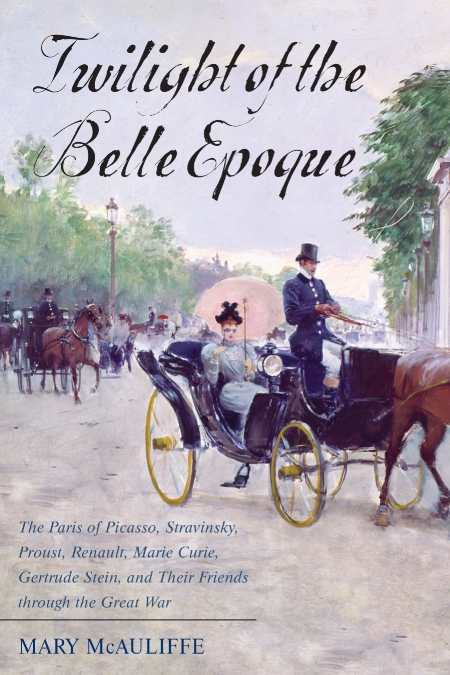 Twilight of the Belle Epoque contains a virtual embarrassment of riches and will be of most interest to readers seeking a highly detailed review of that era. Others, hoping for an analysis of how the earth-shaking cultural changes have reverberated to our modern times, might feel overwhelmed by the author’s exhaustive, chronological approach. Nevertheless, McAuliffe’s knowledge of and enthusiasm for this time is evident on every page.